The RF Modulation Spectroscopy Setup is a precise prealigned, fiber coupled, spectroscopic platform. 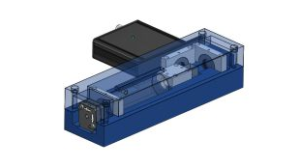 With its help it is possible to stabilize external cavity diode laser also as DFB laser systems on top of line to atomic references via fast laser modulation. 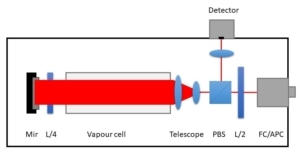 The RF Modulation Spectroscopy Setup is able to generate a locking error signal on a the top of the line of an atomic reference vapor spectrum. This error signal enables to stabilize the wavelength of the emitted laser radiation in combination with the LB2001 and LB2005 and results in a frequency stabilized narrow linewidth of tunable laser systems.